All the models running on the O-gauge layout ‘Tafsil’ are equipped with standard three link or screw link couplings. 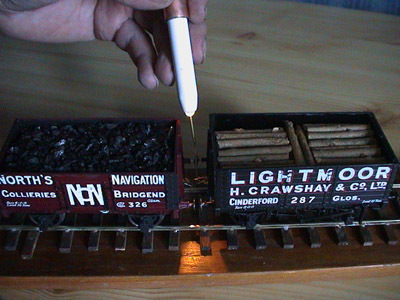 Home-made hooks are used for manual uncoupling. However, it is often difficult to see the links properly due to the position of the lighting. This tip describes a simple hook built onto a pencil torch to overcome this problem. A short off-cut of copper tubing (left over from DIY plumbing), slightly larger in diameter than the torch, is selected. A piece of 1/16th inch brass tubing is soldered to the copper. A piece of fine brass rod is soldered into the end of the brass tube and the end bent to form a hook. The copper tube is slipped onto the torch, using a piece of tape around the torch to ensure a snug fit. The hook faces inwards, i.e. directly under the beam of light. The next picture shows the uncoupler in action.